If you’re applying for college, you might have been warned that your online presence can affect your chances for admission. Not only that, but negative aspects to your online life can follow you farther into adulthood — even if you think you’re immune. 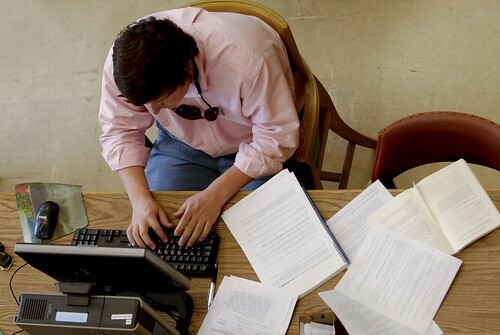 The New York Times recently reported that online scrutiny of college hopefuls is growing. If you’re applying to college, be aware: comments you casually make online could negatively affect your prospects. Not only does the admission process often include a general internet search of prospects by name, but also monitoring of that person’s social networking sites, including Twitter. Recently, a high school senior attended a campus information session at Bowdoin for prospective students. Throughout the presentation, she apparently posted disparaging comments on Twitter about her fellow attendees. Bowdoin monitors its mentions on social networking, so they caught the student in the act. Ultimately her application was rejected for other reasons, but the Twitter indiscretion would certainly have impacted her chances of admission. And it doesn’t stop with college applications. According to Opposing Viewpoints in Context, applying to college isn’t the only thing you should worry about when you post your information online — your profile can follow you as you try to get a job. According to a 2005 study, 75% of recruiters use internet research as part of the applicant screening process. Privacy settings aren’t so private, either. Oftentimes screenshots of “bad behavior” can get to admissions officers, reports Kat Cohen for the Huffington Post. Altered or fake screen names can sometimes be traced back to the real person, and simple internet searches can also bring up sites or postings that the applicant doesn’t want to be seen. However, you can use the internet to your advantage. SafetyWeb.com reports that lots of students put work into their online presence and reputation — which result in a possible positive edge when applying to schools. Managing your online reputation can pay off, highlighting your activities, positive community work, or insightful comments. Check SafetyWeb.com’s online guide for more information about your online presence. Take charge of your online life — evaluate your community, look closely at with whom and where your spend your time, and make positive change — both online and off!